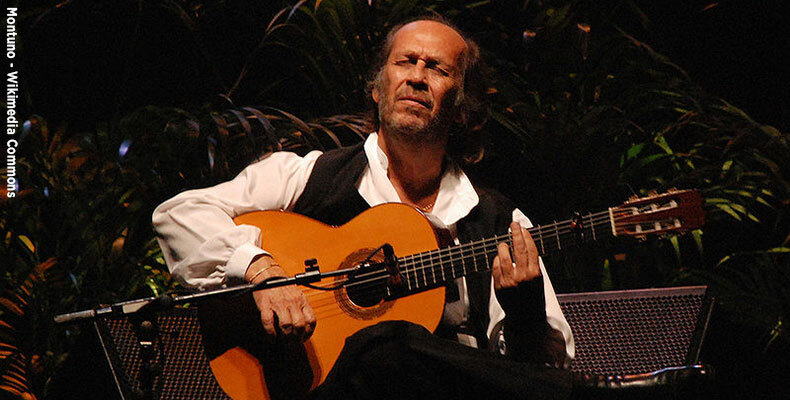 [CNN, BBC, LTTW, FLAMENCO WORLD] One of the guitar giants, Paco de Lucia, who is considered the world over as the Maestro of Flamenco Guitar, has died. He was 66. He is reported to have died in the Mexican resort of Cancun after a heart attack while playing with his children on a beach. Miguel Nunez, the Algeciras spokesman, said the preliminary cause of death appears to be a heart attack. The Flamenco has grown to be one of the most well-known among the world’s roots music in decades, where the audiences have a huge enthusiasm for artist like The Gypsy Kings; but de Lucia paved the way. Paco de Lucia is known for his many daring works in response to the development and establishment of Spain’s Flamenco music. He was believed to be the first person who capable of evoking the true rhythm of Flamenco dancing into guitar playing, for which he is credited with transforming the folk art of Flamenco into a more vibrant new style. Moreover, he has determined the direction that Flamenco guitar has taken for decades. A pioneer of the New Flamenco style, de Lucia’s career is defined by wearingly global tours, recordings, and crossover collaborations with musicians such as Eric Clapton, John McLaughlin, Al Di Meola, Ravi Shankar, and Chick Corea. Paco de Lucia was surely one among the world’s inspiring individuals whose works have been the beacon for many young generations. We may have lost him, but he was and still is sounding the heartbeat we all should listen to.